Derbali risked his life to save others. Canadians are pitching in generously to help one of their own after he risked his life protecting others during this year's Quebec City shooting. On Jan. 29, 2017, Aymen Derbali was rushed to the hospital with seven bullet wounds in his body. According to reports, he'd intentionally drawn shooter Alexandre Bissonnette's attention towards himself to keep him from shooting more people. Six people were left dead in the attack. He went into a coma, and when he woke up two months later, he was paralyzed because of two bullet fragments that remained in his spinal cord. Derbali is currently undergoing physiotherapy and is staying at a specialized facility, but soon he will need to leave, and when he does, he and his family will need a new home that can accommodate his new needs. Delbani was paralyzed because of two bullet fragments that remained in his spinal cord. That's where DawaNet's online fundraiser comes in. 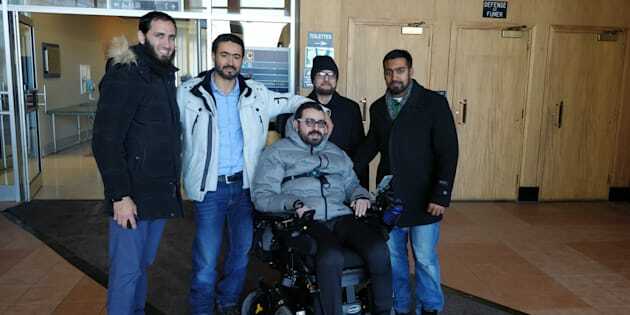 The Canadian-Muslim non-profit started a LaunchGood campaign on Dec. 17 to raise money for a new home for Derbali, his wife and his three children after reading about his story in the Globe and Mail. Along with being a father, Derbali — who came to Canada from Tunisia in 2001 — worked hard as an IT specialist, and studied to improve his English, and learned Spanish while working as an Oxfam aid worker in Bolivia. But he told the Globe he doesn't regret his actions that day and he's still proud to be Canadian. "I would rather have been paralyzed for life than to have fled and been left unscathed, without having done something to help people," he said. "This hasn't changed my vision of this country. I'm proud to be Canadian. What happened could have happened anywhere in the world." Delbani is currently undergoing extensive physiotherapy. The fundraiser's goal is $400,000, which would cover both the cost of the house the community picked out to fit Derbali's needs, plus some minor renovations to make it even more suitable. In just 10 days, Canadians have gotten him halfway there. They have another month to get him the rest of the way there by the time the campaign wraps up on Jan. 28. The generosity is heartwarming but it shouldn't be surprising, according to DawaNet volunteer Amira Elghawaby. Shetold CBC Radio that Derbali's heroic story and the fundraiser's timing encourage people to donate. "We are also in the holidays by coincidence, so many of us are thinking about all the blessings in our own lives," she said. "He was trying to actually get [the shooter's] attention so that he would focus on him instead of the others, and he would give the others an opportunity to get away." Tariq Syed, who also works with DawaNet, told Buzzfeed News that Derbali is overwhelmed by all the support. "He doesn't think he's a hero. He says he did what should have been done," Syed said. He also said the fundraiser's success — along with the past success of a different fundraiser for victims of the shooting — showed the spirit of Canadians. "One thing we learned is how Canadians come together when someone is in need. It doesn't matter what faith background, what culture, what race they come from."